Main Idea: It seems God allows history to run its course. But His unusual interventions demonstrate that He was never absent in the first place. A sympathetic Princess and Moses (2:1-10). Where did she get the idea of the basket? Many scholars have been impressed by a similar story about another Semite, Sargon of Akkad from the second half of the third millennium B.C. He, too, was placed in a basket of rushes coated with pitch and cast on a river only to be found by Akki the gardener who rescued him and raised him as his son. 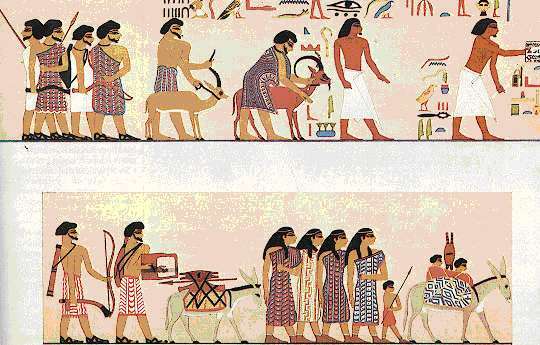 Who was the Pharaoh who enslaved Israel? Possibly the King of the new 13th dynasty (family) who came to power about the time Joseph died. It is probably much later, after the name of Joseph had been forgotten and his great achievements perhaps attributed to Imhotep. This is supported by Stephen's sermon in Acts 17:18, "Then another king, who knew nothing of Joseph, became ruler of Egypt." The population of Israel had to be large and the element of fear of allying with Egypt's enemies was the primary motivation. 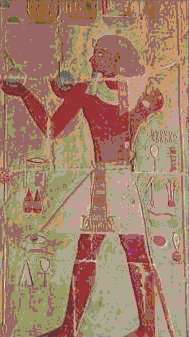 Or it could be after the Egyptians gained control of all Egypt, and they were afraid that the Hyksos would regain power (best guess); the Pharaoh would be Ahmose I. Who was the Evil king who ordered infanticide? 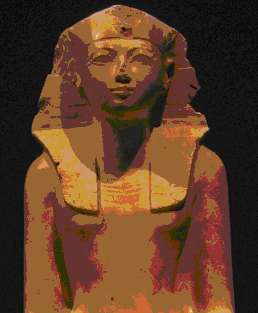 Perhaps a young woman named Nefure, whose name was later changed to Hatshepsut when she became the second and perhaps last female Pharaoh in Egyptian history. We'll discuss her more next week. Why did she deliver Moses? Hebrews 11:23, "By faith Moses' parents hid him for three months after he was born, because they saw he was no ordinary child, and they were not afraid of the king's edict." Acts 7:20-21, "At that time Moses was born, and he was no ordinary child. For three months he was cared for in his father's house. When he was placed outside, Pharaoh's daughter took him and brought him up as her own son." A legend that Amram (Moses' dad) had a prophetic dream (like Joseph in the NT). Is it right to lie to save a life? The midwives lied to Pharaoh and made up a story about how Hebrew women gave birth. WWII--Corrie Ten Boom & family...lied to save lives of Jews...right or wrong? Maternal instinct made Moses' mother hide her boy at the risk of her life. Are foreigners as human as we? If Hatshepsut was in fact Moses step-mother, it seems that she tried to make up for the evil infanticide that her father, Thutmose I instituted....She loved foreigners. God Gets the job done in unusual ways. Moses, a baby floating in a basket in a crocodile-infested river. Matthew 2:14-15, "When he arose, he took the young child and his mother by night, and departed into Egypt: And was there until the death of Herod: that it might be fulfilled which was spoken of the Lord by the prophet, saying, Out of Egypt have I called my son." Both grow up and show their strength. The Law came through Moses, Grace and Truth through Jesus Christ. What about you? Has God delivered you through the death of Jesus Christ? Jesus died for you, suffered for you, rose for you so that God could forgive you. Have you invited Him into your life to forgive your sins and be your Savior? If not, would you like to do that right now?